I bought Hot Chocolate, along with Cardamom French Toast and Mulled Wine, from DavidsTea’s winter collection because of the amazing fragrance that the dry leaf had. I opted not to get Sweet Almond Green because it smelled like marzipan (just not my thing) and I wasn’t sure about Snow Day – I might go back and get some of Snow Day to try though, mint and chocolate are delightful flavours to have together. 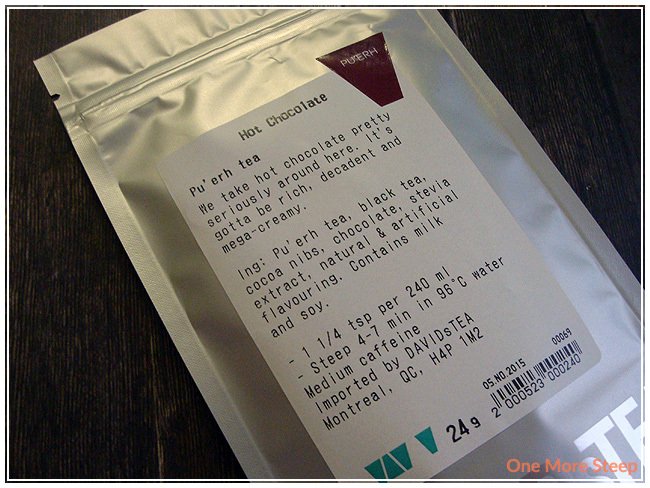 This is the first pu-erh tea that I’ve bought from DavidsTea, and it’s also the first one that I’m reviewing for One More Steep. Despite growing up drinking pu-erh and other Chinese teas, I don’t actually buy a lot of it for myself mostly because my parents do that for me in keeping the familial tea cupboard stocked. I was really intrigued by this tea when I noted the name and smelled it in store because I really like hot chocolate, especially in the winter season. 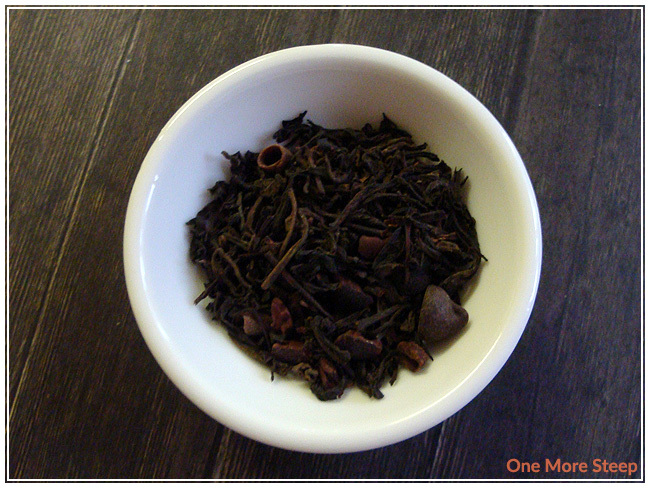 The tea itself has a great earthy base from the pu-erh and it has an amazing chocolate fragrance to it. It’s quite inviting, and I knew that I wanted to try it as soon as I smelled it. The tea itself is quite exciting, it has remarkably large chocolate chips and the beautiful fragrance, and you can see the majority of the ingredients quite easily. The ingredients for Hot Chocolate are: pu-erh tea, black tea, cocoa nibs, chocolate, stevia extract, natural and artificial flavouring. There’s also an allergen warning that the tea contains milk and soy. I know some people dislike products that contain stevia and other artificial sweeteners, so do note that the tea contains stevia. I have a sweet tooth, but I generally sweeten my teas with sugar or honey if it’s needed, so I’m curious to see if I can taste it because I know some people say that they can taste stevia when it is added to things because it has a distinct flavour. DavidsTea recommends steeping Hot Chocolate in 96°C (204°F) water for 4 to 7 minutes. I steeped my cup of Hot Chocolate for about 6 minutes. Hot Chocolate steeps to a beautiful deep brown colour, there’s a notable sheen of oil on the top from the chocolate that had melted during the steeping process. The aroma of the tea is not surprising, given the fragrance of the dry leaf: it smells of mostly of chocolate with the faint earthiness of the tea base. When I took my first sip, I wasn’t sure if I was pleasantly surprised or let down. While I knew there was no way that the tea would match up to real hot chocolate, I still had the hope that it would. Hot Chocolate tastes like a very sweet, but watery, hot chocolate. When drinking the tea, I can taste the pu-erh earthiness and it matches well with the chocolate and doesn’t allow the chocolate to overwhelm the flavour profile. There is an oily mouthfeel to this tea, as I would expect from a tea that has chocolate, but it isn’t off-putting when the oils from the chocolate lingers a little bit in my mouth. Hot Chocolate does really well with the addition of milk. It does still taste like watered down hot chocolate, but the milk helps to cut the sweetness from the stevia and chocolate ingredients. 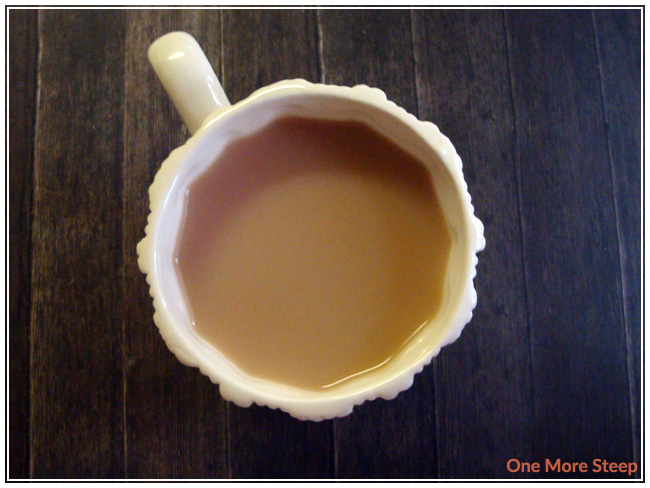 I think that the tea might do even better steeped in hot milk rather than water. Hot Chocolate did not fair well for a second steeping, which is unfortunate. It still has the lovely chocolate fragrance, but it tastes like further watered-down hot chocolate and that just makes for a very unhappy cup of tea. I thought that DavidsTea’s Hot Chocolate was just okay. I think I had higher expectations for this tea because of the name and the great chocolate fragrance that the dry leaf had. 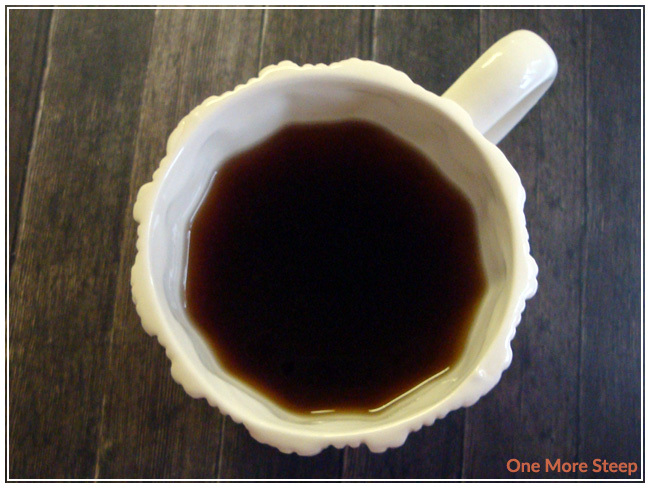 I wish that the pu-erh tea had a greater presence, or that it was a richer chocolate experience. It definitely improved with the addition of milk, which adds to legitimize the claim that it like hot chocolate – I almost always make hot chocolate with milk. I really do think that Hot Chocolate might do better steeped in hot milk rather than water, if I get some time to try that out, I will share how it goes!